This is a great go-to entrée, side or healthy snack. 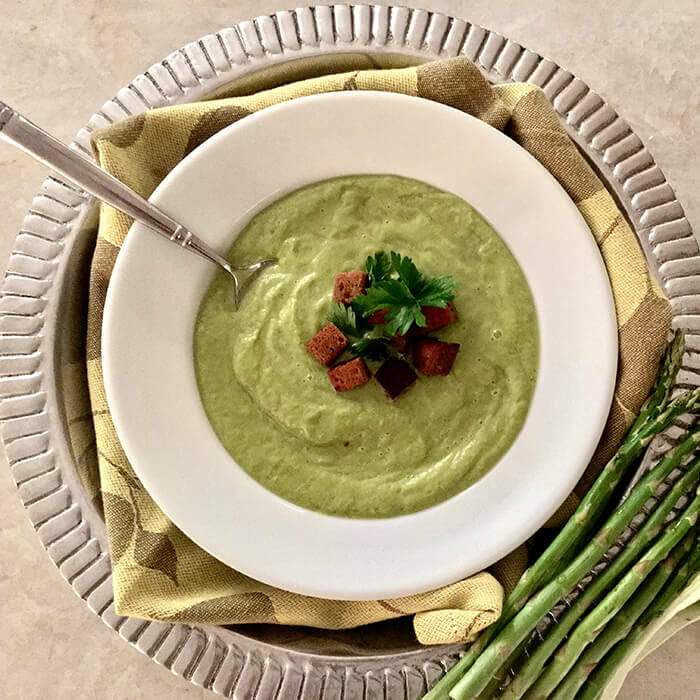 It’s quick, with just six ingredients, and since the vegetables are lightly cooked, you’ll be receiving the full nutritional value and enzymes from these ingredients. Coarsely chop the asparagus and leek. You can keep the garlic cloves whole or just cut in half. Sauté these ingredients for 3 to 4 minutes in a little olive oil. You will begin to see the vegetable mixture brighten in color. Transfer to a blender and add the vegetable broth. Once the mixture is coarsely blended, add the avocado continue to blend. You might need to add more broth depending on the consistency you like best. Asparagus is not only delicious, it's packed with multiple health benefits. It's a great source of dietary fiber, trace minerals and vitamins. It can help fight cancer, and it's a brain booster. Add any spice you like to the blender: I usually add turmeric, though dill tastes great, too. You can top it with chopped chives, croutons, pumpkin seeds - get creative!